At least in the first year of his existence, Gimpel Beynish was a solitary fellow: he had no home, no wife, no kids, no relatives. Just customers. So when it comes to Passover, he has nowhere to go. He gets his loser buddy to pretend some interest in getting hitched to a missus, that's to say a landlady (is it Gimpel's landlady? or is she a customer?). She woos him with a fine meal and wine and matzoh - and Gimpel, as matchmaker, gets to partake as well. This Thanksgiving my kids are elsewhere and I decided I didn't want a traditional Thanksgiving meal if I couldn't have it with them, so I'm on my way to Statesville, NC, where I'll eat dinner alone at Waffle House, spend the night in a motel, and then go to the Dixie Draft Horse and Carriage Auction first thing the next morning. They'll be auctioning mules, donkeys, horses, farm necessities, Mennonite carriages, and all the rusty junk you could ever hope for. This one's from the Gimpel Beynish book I just published. 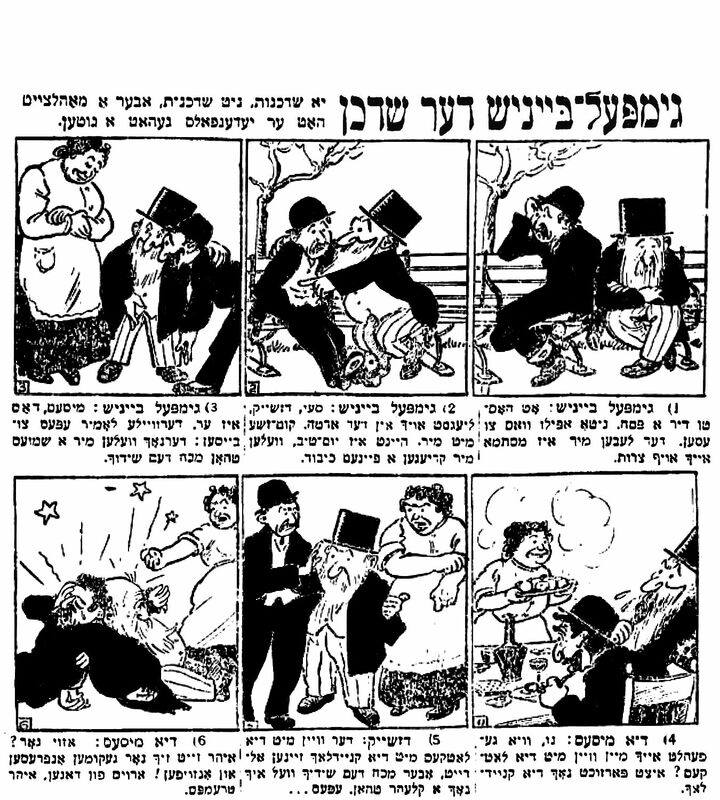 In the first months of its publication, the Gimpel strips had this 3x2 panel format. April 23, 1913: Matchmaker's fee or not, at least he got a good meal out of it this time. GB: What a Passover. Not even anything to eat. Life is misery. GB: Say, Jake, you too are lying in the earth. Come with me. Today's a holiday. We'll get a fine meal. GB: Missus, here he is. Meanwhile, let's have a bit of a snack; later we'll talk about the match. The Missus: So how do you like my wine and latkes? Now try the dumplings. Jake: The wine and latkes and dumplings are all right, but concerning the match... I want more time to consider it. The Missus: Is that right? You just came to gorge and guzzle? Get out of here, you tramps. יאָ שדכנות, ניט שדכנות, אָבער אַ מאָהלצײַט האָט ער יעדענפֿאַלס געהאַט אַ גוטער. גימפּעל-בײניש: אָט האָסטו דיר אַ פּסח. ניטאָ אפֿילו װאָס צו עסען. דער לעבען מיר איז מסתּמא אױך אױף צרות. גימפּעל-בײניש: סעי, דזשײק, ליעגסט אױך אין דער אַרטח. קום-זשע מיט מיר, הײַנט איז יום-טוב, װעלען מיר קריעגען אַ פֿײַנעם כּיבוד. גימפּעל-בײניש: מיסעס, דאָס איז ער. דערװײַלע לאָמיר עפּעס צובײַסען; דערנאָך װעלען מיר אַ שמועס טהאָן מכּח דעם שידוך. די מיסעס: נו, װיא געפֿעהלט אײַך מײַן װײַן מיט די לאַטקעס? איצט פֿאַרזוכט נאָך דיא קנײדלאך. די מיסעס: אַזױ גאָר? איהר זײַט זיך נאָר געקומען אָנפֿרעסען און אָנזױפֿען! אַרױס פֿון דאַנען, איהר טרעמפּס.